When you speak to your customers, are you known as a resource or a nuisance? 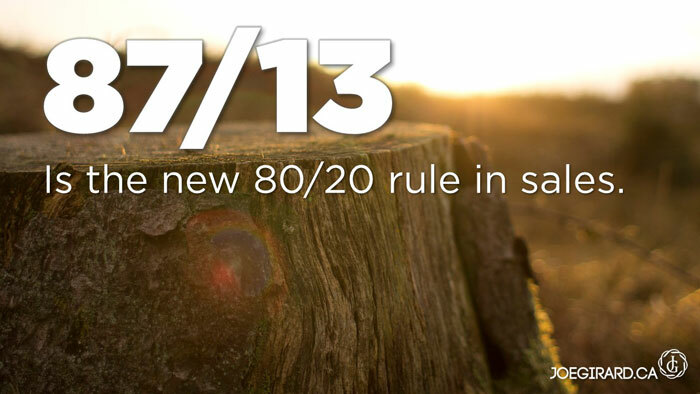 Anyone in sales knows the Pareto principle. 80% of the sales comes from 20% of the sales force. This has been a long-standing figure and used to illustrate the difference between high performers and the rest. Now, the research is showing that the number has shifted to 87/13. With all this information, sales training, processes, and systems at our fingertips, why do only a handful of sales professionals succeed? The BEST in the field succeed because of their preparation, adding value to the customer, and providing insights. Most amateur salespeople work on product knowledge, closing techniques, and just going through the numbers. If you want to get to the next level and make sure you are in that top 13%, keep reading. 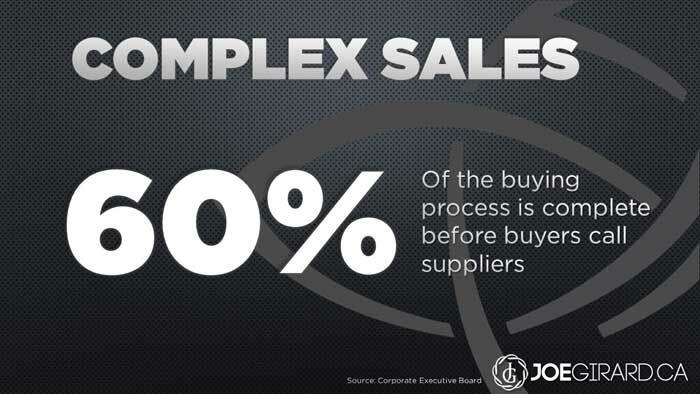 Let’s first understand what a complex sale is. There is a massive difference between the old-school transactional sales process and today’s multi-step, information-overload, complex sale. Essentially, a complex sale is any time you have more than one step – that is – it takes more than one meeting to get the deal done. And complexity comes into play because the customer is making the decisions in the intervals between the meetings with the salesperson. But often I see that salespeople are trying to go for the transactional sale every step of the way. You may be just plain annoying to your customer. In a complex sale, the customer goes through a series of decisions, and your job is to help facilitate good discussions, not be simply a source of information. You see, today, buyers are 60% through the buying process before they engage with a salesperson. But the majority of customers still want to interact with salespeople. What does that mean your role is, then? 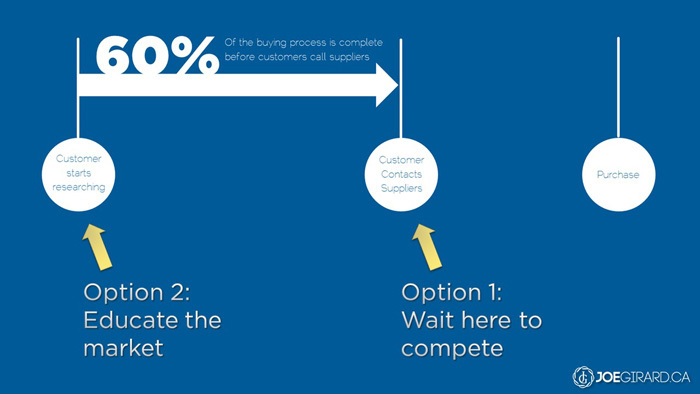 It is to add VALUE to the process your customer wouldn’t normally be able to get on their own. Okay, so we know that our buyers have already begun their research and are coming up with ways to solve their problems, so what do we do about it? Well, if you are like most salespeople, you can fall back into trying to solve customer problems. You wait for them to contact you and tell you they are interested in your product or service and you go and try to “uncover their needs,” right? WRONG. In today’s market, your customers already have a pretty good idea of what they think their needs are. If you go in and start discussing their needs, you’re dead in the water. I hear so many salespeople tell me that they are a problem solver. Don’t be a problem solver, be a problem finder. That’s what the BEST salespeople do. Your job is to take a deep look at the customers situation, and instead of trying to be the BEST choice when they start the sales discussion, get in their head way before they are even thinking about it. Don’t wait for the customer to figure out they need you. Find a way to show them they have a problem. To do this, it will take some preparation, research and planning. You want to be so good at understanding what’s going on in your customer’s world, that they try and hire you to be on their executive team. In today’s selling environment, you want to be the first one they call when they are looking at problems, opportunities, or need help seeing around corners. If you educate your customers in this way, you create sales conversations that aren’t available to your competitors. If you wait for customers to understand their problems first (and I use the term understand loosely), then you put yourself in a competitive environment where often price becomes the issue. Educating customers gives you more non-competitive deals, higher average deal size, and price becomes less relevant. I was interviewed last week by Dr Isaac Jones for his High Performance Summit where he has been interviewing some of the most influential and successful people from around the world. Behavioral scientists, Olympic athletes, NLP masters, and billionaires. I was fortunate enough to be on his panel and we discussed success habits, science of the mind, change, and personal development. In our talks, he said the one common theme from every high performer is that they PREPARE. They do all the hard work to make it look easy. They understand that success does not come by accident – it requires focus, process, and consistency. the little things each day that all add up. So ask yourself in your sales process, when was the last time you did some deep-level research into your industry? What about your customers industry? How about behavioral change and influence? Do you study and practice your connection skills and ability to communicate effectively? How well can you persuade and move people? These are the questions that every professional must ask themselves and there is a reason that only a few people are at the top of their game. Not magic, not charisma, and they sure weren’t born with it. They prepared. If you want some mind science goodness, check out my four part series on “Why we make decisions based on emotions.” It will help you get some serious focus. 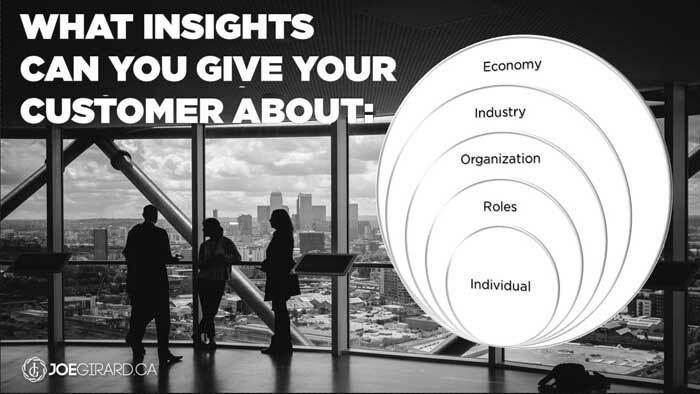 So what should you provide insights on, you might ask? 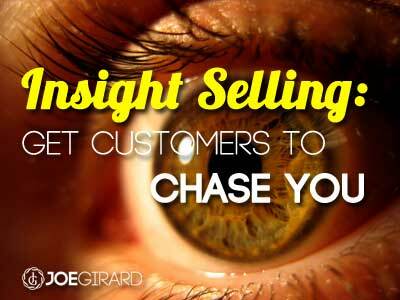 Insight selling is about first looking at the customer you’re dealing with and putting yourself in their shoes. What are the most important items on their list right now? What is pressing? What economic drivers do they look at and what do you think they are concerned about most? What are the problems of the customer of their customer? We have all heard the question, “What keeps you up at night?” Which has been used to death in customer conversations. And buyers are sick of being asked that. While your questioning skills are very important (read my post and video on using SPIN Selling), to do a better job, start asking yourself what keeps your customers up at night. Sit down and put yourself in their shoes. Imagine what their world looks like. When they go into meetings, what would they discuss and what are the challenges and potential landmines they don’t see. Now find ways to uncover those landmines and determine ways you could uniquely solve them. This is what the true sales superstars do. They make it their mission to go in search of opportunities for their customers, not themselves. And guess what? Their customers call THEM when they want answers. So it’s not about getting your calls returned, it is about making sure that when you call, you have some VALUE to offer your clients. This may seem like a big process and a lot of work, and…well…it is. BUT, the reward of massive success is yours for the taking if you are willing to do the work. If you are going to build insights into your process, start with the area with the broadest scope and then work your way towards the individual. The economy: What insights can you provide your customer on the economy and what is happening in the world? What are the trends that would affect them? What ways are consumers different today than they were ten years ago? One example is that since the economic crisis, we are now seeing more businesses moving away from maintenance mode into aggressive growth mode, and increasing spending. More of your customer’s customers are looking at making purchases today than they were five years ago. Your customer’s industry: What can you tell them about the competitive landscape they are in? What are their customers doing that they may not see? How can you help them better understand the supply chain they are a part of? What partnership opportunities could you help them identify? Their organization: Can you take a hard look at the way your customer operates and find ways they could better optimize their systems? Could their be resources you could provide their teams? Is there perhaps technology they could find useful? Do you see any redundancies or efficiency challenges? I do a lot of work looking at cause and effect issues in my client’s organizations. We look at the processes and systems and see around the corners and into the future. Spelling it out for my clients gets them to see things they didn’t before and opens up a dramatically new dialogue and opportunity. The roles of the people: Now you start to get into the heart of it. When you look at your customer’s business, can you see who the tribal leaders are? Do you know who would be the most influential in helping further your discussion? How can you add value and speak the language of the entire team? One of the trends that I am seeing is that more decision makers are deferring to their teams to make decisions, and it is up to you to gain widespread acceptance from many different people. To do this, you must know all the interdependencies across the teams and what is important to them. The role of the individual: Building on the previous point, you must understand what drives the person you are speaking with. How can you understand their fears and desires better than they understand themselves. If you want to know what keeps them up at night, get into bed with them (metaphorically speaking of course. But your choice). Before your next meeting with your client, can you imagine what a day in their life feels like? What stresses them out? And what would absolutely change the course of their day? What undesirable effects happen to them day in, day out? When you start to set those questions and create an empathetic mindset, you quickly start to see how to position your products and services from THEIR eyes. As we have covered, customers today don’t want to hear from you unless you are interesting and add value. they don’t want to build relationships with you, BUT you can earn the relationship by demonstrating crazy amounts of value to them. What resources can you provide them? How can you ease their concerns? How can you simplify their lives? What can you learn from behavioral science that helps you better connect with them? How can you be someone in your community, in your supply chain, in your family who is always known as a trusted expert, a resource, a giver, and an influencer? It takes hard work to get there, but you will reap massive rewards and sell with more joy. I hope that helps you sell more, get more calls returned, and make customers chase YOU. Leave your comments below and let me know how this applies to YOUR business. And SHARE the post! Joe, Great post! It was a very refreshing look at the selling process, I really like to complex and incremental approach. I do a ton of direct selling to hockey players and their parents and our company has always really been focused on showing the logical value of our company and I love the idea of giving value and putting ourselves in the customer’s shoes. Thanks! Glad you enjoyed it! I think you are bang on with showcasing value for your offering for sure. I took a look at your site, and you guys definitely have a solid brand. You may want to add some free resources front and center that people can check out – videos, how to’s, etc. Check out yesterday’s post as well on some ideas: https://joegirard.ca/u2-and-apple-stunt-give-away-best-stuff-free/. You can then share those resources with parents and kids as part of your process. Perhaps even a free downloadable training guide to get email addresses? The other thing you may want to do is create a cool infographic showing insights and the results of training like yours over time for different age groups. You could even provide specific info for each of your segments. ie for the players who are seriously committed, who are just looking to up their skills, or those who just want to enjoy their rec games more. Just some ideas for ya. Keep me posted and glad to connect! What I found out and your post Joe proves it that education and value are the most important contributors for conversion. I’m gearing for increasing my customer acquisition and feeling very excited about it…who said that sales are boring! Glad to hear, Olga! Most people struggle when selling because of the internal feelings and that emotional rollercoaster we always talk about. But when you shift your mindset to that of helping, giving, and educating, it becomes really exciting to sell! I’m stoked that you are having fun with it, so keep on rockin.